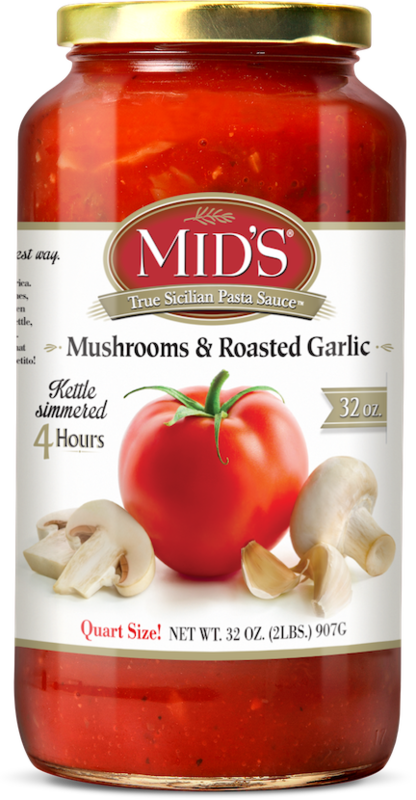 In MID’S Mushrooms and Roasted Garlic sauce, two unmistakable flavors come together for a rich, satisfying taste, reminiscent of the old country. Mushroom lovers, we dare you to find a sauce with more ‘shrooms! You’ll rejoice in the abundance of sliced mushrooms, fresh from eastern Pennsylvania. And, the distinctively mouthwatering aroma of roasted garlic adds just the right touch to this savory sauce. A must-try for anyone who loves garlic bread on pasta night, Mushroom and Roasted Garlic sauce is an all-natural, gluten-free pasta topper, as well as a delicious, convenient dipping sauce. It’s sure to become a family favorite. Ingredients: Water, Tomato Paste, Mushrooms (Mushrooms, Water, Salt), Sugar, Olive Oil, Salt, Onions, Romano Cheese (Made from 100% Pasteurized Sheep’s Milk, Bacterial Culture, Salt, Rennet), Roasted Garlic, Garlic, Citric Acid, Spices, Paprika.